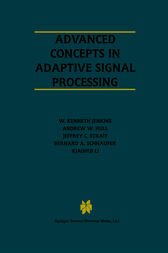 Although adaptive filtering and adaptive array processing began with research and development efforts in the late 1950's and early 1960's, it was not until the publication of the pioneering books by Honig and Messerschmitt in 1984 and Widrow and Stearns in 1985 that the field of adaptive signal processing began to emerge as a distinct discipline in its own right. Since 1984 many new books have been published on adaptive signal processing, which serve to define what we will refer to throughout this book as conventional adaptive signal processing. These books deal primarily with basic architectures and algorithms for adaptive filtering and adaptive array processing, with many of them emphasizing practical applications. Most of the existing textbooks on adaptive signal processing focus on finite impulse response (FIR) filter structures that are trained with strategies based on steepest descent optimization, or more precisely, the least mean square (LMS) approximation to steepest descent. While literally hundreds of archival research papers have been published that deal with more advanced adaptive filtering concepts, none of the current books attempt to treat these advanced concepts in a unified framework. The goal of this new book is to present a number of important, but not so well known, topics that currently exist scattered in the research literature. The book also documents some new results that have been conceived and developed through research conducted at the University of Illinois during the past five years.